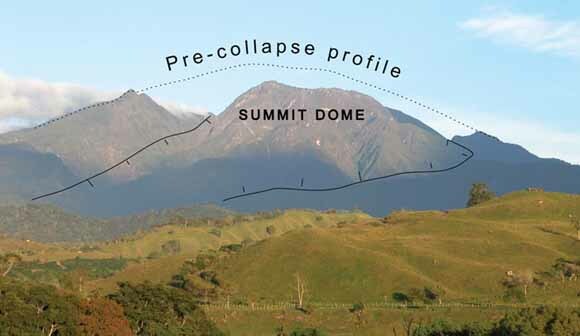 View of Volcán Barú from the west, showing reconstructed profile of volcano before debris-avalanche collapse many thousands of years ago (from figure 2). Volcán Barú is a potentially active volcano in western Panamá, about 35 km east of the Costa Rican border. The volcano has had four eruptive episodes during the past 1,600 years, including its most recent eruption about 400–500 years ago. Several other eruptions occurred in the prior 10,000 years. Several seismic swarms in the 20th century and a recent swarm in 2006 serve as reminders of a restless tectonic terrane. Given this history, Volcán Barú likely will erupt again in the near or distant future, following some premonitory period of seismic activity and subtle ground deformation that may last for days or months. Future eruptions will likely be similar to past eruptions—explosive and dangerous to those living on the volcano’s flanks. Outlying towns and cities could endure several years of disruption in the wake of renewed volcanic activity. Described in this open-file report are reconnaissance mapping and stratigraphic studies, radiocarbon dating, lahar-inundation modeling, and hazard-analysis maps. Existing data have been compiled and included to make this report as comprehensive as possible. The report is prepared in coooperation with National Secretariat for Science, Technology and Innovation (SENACYT) of the Republic of Panamá and the U.S. Agency for International Development (USAID). 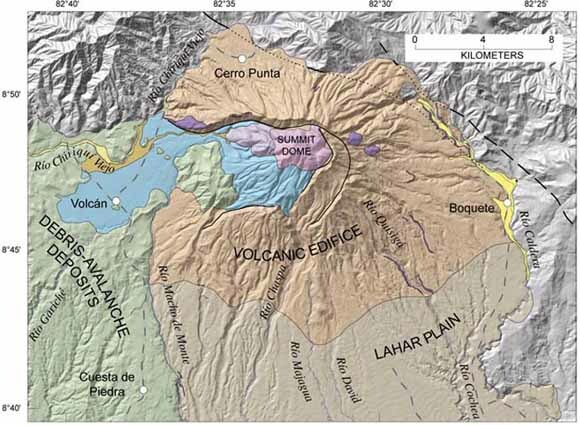 Simplified geologic map of Volcán Barú (from figure 8). Report as a 33-page PDF file (OF2007-of2007-1401en_text.pdf; 3.7 MB). Plate 1, Volcano Hazards of Volcán Barú, Republic of Panamá as a ~32" x 21" PDF file (of2007-1401en_plate1.pdf; 3.5 MB). Spreadsheet with whole-rock geoochemical analyses from Table 5 in the report, with geographic coordinates (of2007-1401_table5.xls; 123 kB). Parte 1 del informe y la mapa de amenaza (hoja 1) se disponible en traducción español. Informe, 11 paginas, en filo PDF (of2007-1401sp_text.pdf; 1.4 MB). Hoja 1, Amenaza de Volcánica del Volcán Barú, Repáblica de Panamá como a ~32" x 21" PDF file (of2007-1401sp_plate1.pdf; 2.8 MB).